Lubéron Ours white wine bottled by the family Perrin is a dry white wine fresh and pleasant as well to the apéritif as on products of the sea. The Perrin family produces this Ours blanc on the slopes of the Mount Ventoux, vineyards benefit from a climate fresher than in plain. Grapes mature there more slowly and keep a better acidity. 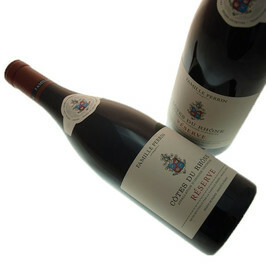 The wine which results from it is greedy, fresh and well-balanced. Rather light country near Caromb, at the foot of the Mount Ventoux. This Domain Perrin Ours blanc Lubéron White wine 2015 Perrin family will taste in any opportunity brightened up on your apéritifs and grilled fishes. La famille Perrin baught some land in te Rhone Valley in 1909 with the famous château de Beaucastel, en Châteauneuf du Pape . The wine is made in Prébois, in the city of Orange, when most of the vines, 180 acres are around Beaucastel.The most important organic wine maker of the south Rhone Valley.